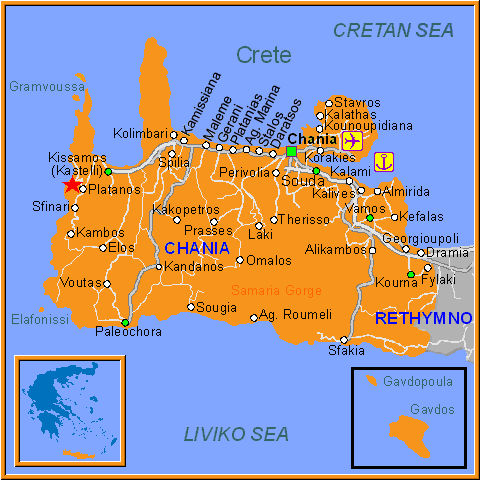 Falasarna is the westernmost village in Crete, located approximately 20km from Kissamos in the neck of the Gramvoussa peninsula. The name Falasarna is pre-hellenic and is derived from the nymph "Falasarni". Falassarna used to be the port of ancient Polyrinia. The peak of the city of Falasarna was during the Hellenistic period and at the time the city had its own coin. Its port was closed and surrounded by walls and it was connected to the sea with a canal. The port and the canal today are cultivated land due to the fall of the sea-level, the ancient remainings are located 300-400 meters from the sea. The secure position of the port, the impregnable fort and the rich valley of the area indicate that Falassarna was a great naval and commercial center. The remainings saved today are part of the supporting walls of the city as well as part of its Cyclopean walls, defensive towers, foundations of houses and remainings of the temple dedicated to Artemida or Appolonas. Online Travel guide with the best accommodation in Falasarna. Find the cheapest hotels is Falasarna & get exclusive online deals. Great rooms at bargain prices. Book online now! Compare Hotel Prices and read Reviews from others. Great Hotel rates and information See photos, reviews & what's nearby Falasarna . Detailed tourist and travel information about hotels of Falasarna providing also regional information.